Sjoerd Bootsma has been involved with Leeuwarden-Friesland European Capital of Culture 2018 since 2011, initially as a writer for both bid books and now as a programme developer in the artistic team. Sjoerd is also the Artistic Director of Welcome to the Village and Explore the North. He founded Podium Asteriks as well as the European Enterprise Promotion Award Winner Innofest, a foundation that enables entrepreneurs to test prototypes at festivals. 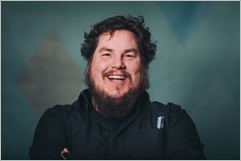 Sjoerd will talk about best practices in the field of sustainability, amongst which the sustainable approach of his festival Welcome to the Village. A festival run by a bunch of happy activists. People that believe cultural spaces, like festivals, are in fact great places to protest existing structures, and hands-on reinvent them for the duration of the festival. They are ideal places to experiment with new ways of living together. For if it works in a temporary town like a festival, then why not in a real town?